Add a touch of traditional fashion to your wardrobe by sewing your own lace jewelry. 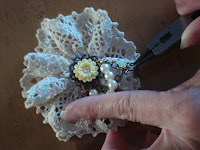 Learn to make a brooch and get classy with your vintage crafting. 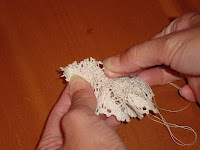 After gathering it tightly, I tied another knot at the end of the lace. 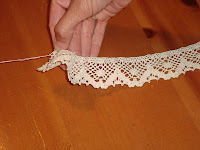 I began by cutting about 18" of the ecru lace. 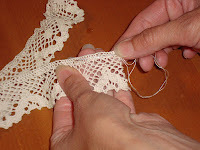 I then tied thread to the beginning of the lace in a secure knot and sewed a gathering stitch near the top edge. 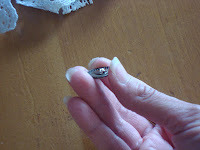 Then, I sewed the ends together from top edge to bottom. The brads needed to be adjusted in order to be sewn, so I folded the brads over crossing in front of each other. It is hard to see here, but it created a small double loop to sew onto the lace from the back. Then I attached the pearl strand (shortened by 3 pearls to fit, and chain to each side of the brad, and the lock and key to the chain. I finished it with a pin backing. Thank you for these great detailed instructions! This technique will be perfect for a floral embellishment of a newborn headband I am working on. Some of the lace I have is scalloped on both sides,but I think it will still,work nicely to make a floral design that I need. Super idea! The Vintage Lace Brooches featured here seems so simple and unassuming but it's actually a work of art. 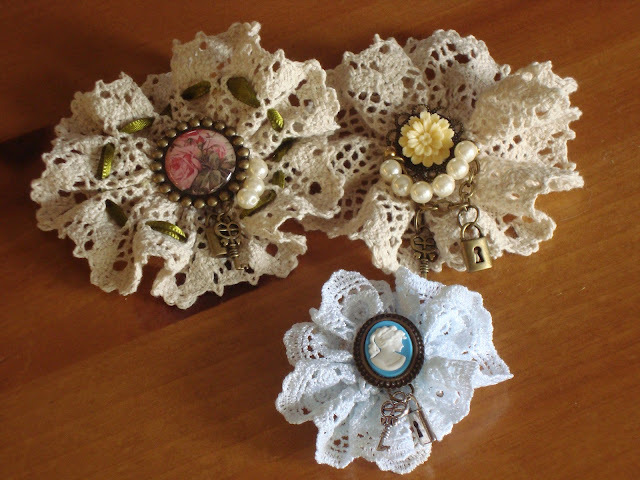 A lot of artistic effort has been given to produce these beautiful brooches from the making of the lace to choosing which stuff should be combine with what. Such creativity. Not all people have that. Cheers! 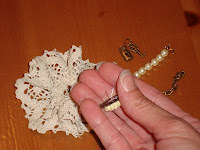 Correction The Vintage Lace Brooches featured here seem so simple and unassuming but they're actually a work of art. 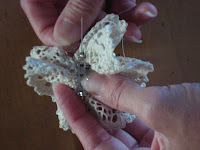 A lot of artistic effort has been given to produce these beautiful brooches from the making of the lace to choosing which stuff should be combined with what. Thank you. These are super easy and adorable. I love to make like these stuffs. Laces are not much used nowadays and actually lot of things can be done out of it . I have made photo frame , wall hangings using laces.But I haven't tried these. Even lace earrings are today's fashion. Eager to make these. Thanks for the wonderful idea. These flowers are so pretty, and they sound easy to make. The instructions are straight forward and clear. Flowers like these are a great way to use up scraps of lace and fabrics that are ordinarily too small for any other type of project. Wouldn't this be a great way to use up scraps of wide ribbons too? I have made these for years. I make them with different color lace for the holidays.. red or green lace for Christmas put Christmas embellishments in the center. I use those small bathroom plastic cups cut the bottom around the edge glue that on to the back of the lace.. that gives it a better backing. I have also put a small hole in the plastic circle attached a ribbon or cord used them for tree decorations. I don't have a photo of them right now. I love these vintage flowers being made for so many things. What a great way to use leftover laces.They are so simple but so elegant and perfect to make to add on headbands,brooches and even put a clip in for hair. And I love that you can add different things in middle. Has anyone used these for more than the brooches. Thanks. Here is a photo of some of these that I have made over the years. Wow Minny those a some beautiful brooches and I love the color combinations you used. I bet you get a lot of compliments when you wear them. I bet people ask you where you got them and I am sure you are proud to tell them you made them.Did you buy the lace or are some laces passed down? 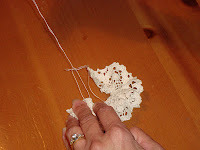 I am going to look in some antique stores for some very old vintage lace to make some for gifts. Would love to make some for a nursing home for gifts for the women in there for Christmas gifts.Thanks for the photos. Hi there, Unfortunately we do not have a video for this project. If you search Silk Lace Bag on this site, you will find a step-by-step tutorial. Thanks!